Christmas time is an exciting season full of celebration, love, and fabulous parties. The DIY ugly Christmas sweater theme has been around for decades and is just as popular today as it was back in its introductory stages. The Christmas tree is one of the most universal symbols of the season. Why not deck the halls in a sweater that mimics this fabulous Christmas tradition. You’ll have fun transforming yourself from a plain green tinsel-filled sweater into a full-blown image of a tree. All you need is a few simple supplies and some decent instructions. This quick video shows you how to create the perfect DIY ugly Christmas tree sweater. The mean old Mr. Grinch is one of the most famous Christmas figures in the books. It’s a celebrated tale that truly demonstrates the magical and transformative nature of Christmas. Why not bring this silly character to life with a Mr. Grinch DIY ugly Christmas sweater? The process is fairly simple and requires a minimal amount of materials. All you’ll need to do is hot glue some lime green tiaras around the neck and hips of a black sweater. From there, you can add your own embellishments like a Mr. Grinch hand in the middle, or a quote from the infamous character. Click here for a great example of the final product. Rudolph the Reindeer is Santa’s right-hand man and a beloved Christmas character across the globe. He’s the most famous reindeer of all and he will definitely be a hit at your next Christmas party. This tutorial offers a very simplistic reindeer sweater option that will wow your friends and family and keep you warm and cozy at your next Christmas event. The materials and time commitment are minimal so you won’t have to spend a lot of time on it. Making a snowman sweater is another awesome holiday idea. Snowmen are widely recognized and there are many popular Christmas characters centered on this childhood theme. Luckily you can easily create a clever and crafty sweater that mimics this fabulous idea. This DIY ugly Christmas sweater is festive and easy to achieve. You’ll love the warmth and compliments you’ll receive on this easy costume. Here is a quick tutorial video for building the perfect snowman outfit. This DIY ugly Christmas sweater adds a cutesy spin to any sweater idea. It’s one of the most simplistic ideas on the list and you can whip it together in just a few short minutes. If you’re in a time crunch, this is a great idea for your next holiday party. The idea is so simple it doesn’t even require a tutorial. 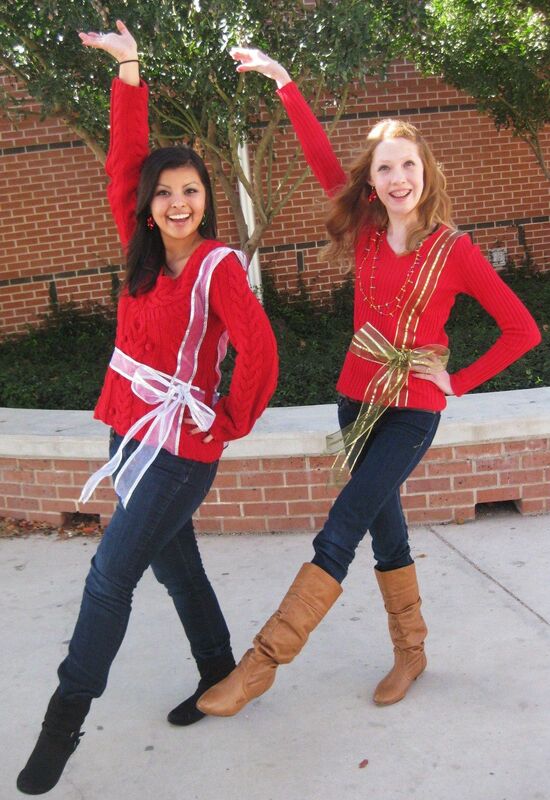 All you need is a sweater and a spool of some fabulously festive ribbon. You’ll simply need to hot glue the ribbon to the sweater and create a large bow. Your friends and family will be amazed if you manage to incorporate festive lights on your sweater. There are lots of ways to complete this DIY ugly Christmas sweater but this tutorial offers the best advice on easily adding some jazz to your sweater. You’ll light up the party with this unique idea and stay glowing all night long. It’s an easy way to spice up a plain sweater and create a festive aura without too much effort. If you feel like spending more time on your sweater, you can weave the lights onto a painted or stitched wreath, Christmas tree, or fireplace imprint. This DIY ugly Christmas sweater is an easy option for someone on the go. You can find everything you need in a heartbeat and throwing this sweater together is a piece of cake. The sweater will be colorful and incorporate lots of Christmas patterns so you can wear all of your favorite Christmas characters and traditions all night long. Most of the supplies are available at Dollar Tree making the sweater appropriate for any budget! Click here to learn more about this tacky tie sweater idea. These are just a few of the many festive DIY sweater ideas. Each of them offers a unique twist on the holidays and allows you to tweak the sweater to fit your special personality. If you’re worried about finding the perfect sweater for your next holiday party, look no further. Try one of these simple ideas today! For more Christmas projects, check out these DIY Christmas decorations.